Electrophoresis in a microscopic fiber (microphoresis) separates nucleic acid components in amounts corresponding to 500–1000 pg RNA (Edstrom 1960 a, 1964 a). This sensitivity permits RNA base analysis at the cellular level. In a scaled- up, somewhat simpler version, cellophane strips are used as the supporting medium (Koenig and BrattgArd, 1963; Ruchel, 1971) for the analysis of 3 000–5 000 pg RNA. Microphoresis in cellophane strips was introduced by Koenig and BrattgArd for the quantitative determination of radioactively labelled RNA, which, with the technique employed, required more RNA than is normally used for fibers. These techniques also lend themselves to base analysis of DNA and, with a simple modification, to the simultaneous determination of DNA content and base composition (Edstrom, 1964 b). 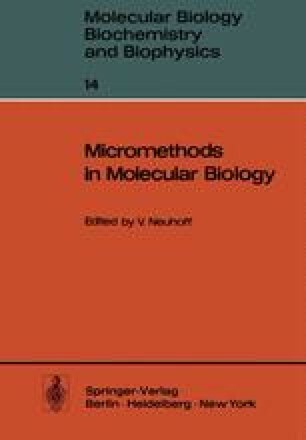 Microelectrophoresis can also be used for enzyme determinations, in which substrate and product are separated after incubation with micro-isolated components, as used for intracellular localization of nucleases in starfish oocytes (Sierakowska, Edstrom, and Shugar, 1964).